God’s unbeatable team: Barak and Deborah! ‘Deborah said to Barak, “Arise! For THIS IS THE DAY in which THE LORD has given Sisera into your hands! BEHOLD, THE LORD HAS GONE OUT BEFORE YOU!” So Barak went down from Mount Tabor with ten thousand men following him’ (Jdg. 4:14). In the past, Joshua destroyed the Canaanites in a mighty victory. Some years later, we find a total different story. A descendant of Jabin, having the same name, has now conquered Israel. God ‘sold’ His people to the pagan king, to be oppressed for twenty years, so that they will repent of their stubborn pride, idolatry and rebellion. Spiritual lesson: sin is very stubborn and demons are very persistent. We are to remain alert to any return of evil spirits rejected in the past. Be filled with the Holy Spirit, not giving the (ex-) devil a foothold at all! This was a very difficult time in Israel. There was poverty, violence and ‘war at the gates’. Most men have lost hope and faith in God. But God raises Deborah as a leader of revival in Israel. Against all odds, this ‘mother in Israel’ challenges the territorial spirits that claim the land. She calls a man of God, Barak and commissions him to go to war against King Jabin and his commander in chief, Sisera. Just like with Joshua, God gives Deborah the strategy and plan for the battle and the assurance of victory even before the war starts. God is totally in charge. God chooses the place, the time and the resources for the battle according to His sovereign will. God decides that the number of the Israel soldiers shall be only 10,000. At the end of the battle they should count them again and see that none died! The army shall be led by Barak covered by the prophetic anointing of Deborah. God also points out a very unusual place for the battle to take place: ‘the ancient, age old’ River Kishon. He promises to go before them and lure the enemy there, in the waters of total destruction. River Kishon is seasonal. During the hot summer, it dries almost completely but in spring time, with the snow on the mountain melting down, it can become a flood, fast and furious. Sisera took it for granted that the quiet river of summer season will ‘cooperate’ with his strategy. He was wrong. His 900 chariots and many horses, the strength and pride of the enemy were ‘swept away’ and all drowned in the waters of judgment. Israel fought but he was not alone. The invisible angels of God fought from above. ‘Heaven dispatched angels called ‘stars’ who fought against Sisera’ and his destruction was complete! National revival has begun! Once more, praises to God were heard over the hills and over the valleys! Praise the Lord!!! Deborah was a judge and a prophetess. She was instructed in Divine knowledge and filled with the Spirit of God. She judged Israel as God’s mouth to them; correcting abuses, and redressing grievances. By God’s direction, she ordered Barak to raise an army of ten thousand volunteers and confront the oppressor. Barak insisted much upon her presence. She promised to go with him. She would not send him where she would not go herself. Those who in God’s name call others to their duty should be ready to assist them in it! Selah! It was very natural that Barak should desire the presence of Deborah. She was a strong woman of great spiritual influence, wise and prudent, able to read the signs of the times. As it has been said, the best definition of a fool is a man who is wise too late, so the best definition of wisdom is wisdom at the right moment. Deborah possessed that wisdom. Free from fear of man, confusion, doubt or religious prejudice she understood the power of moving with God. She identified the destiny moment! She knew when exactly to sound the trumpet and to strike the blow for freedom. In a great national emergency she became a hero, a spiritual mother and mentor to other leaders. She calls Barak to her, ordains and assures him of his commission, and even consented at his request to accompany him in battle. This was heroic, but it was also feminine. Deborah did not assume the direct command of the soldiers. She chooses to remain ‘behind the scenes’, as the intercessor, the spiritual influence and the godly fire of inspiration for the army of Israel. As a man Barak could have rejected Deborah’s assistance. Riding on a horse alongside a middle aged woman and to be told that another house wife will take the glory for the victory… few men desire that… But Barak values submission to God’s will, the success of his ministry and the freedom of his country more than mere human honor. God rewards Barak richly. His name appears in the Hall of fame of people who had faith in God to ‘conquer kingdoms’. These godly leaders have inspired generations of believers up till today (Heb 11:32, 33). Both Deborah and Barak are servants of God! They each did what was required of them! The victory of Israel was total and the land had peace forty years! May we identify our spiritual partners, leaders, mentors, apostles, prophets and coverings over us! May we submit to the anointing of team work! Like the bees, let us work together for the common good! The honey is all that matters! All the glory goes to God alone! Praise the Lord o my soul, and all that is in me, praise His holy name! I can never lose a battle for I obey and follow the Lord of Hosts! No weapon fashioned against me can prosper! No tongue that rises against me in judgment can ever win its case! The tongue of the accuser of the brethren is condemned! The devil shall expose and condemn himself! Like Deborah, I am a virtuous wife, a godly mother of children and a grandmother of my children’s children! They surround me! 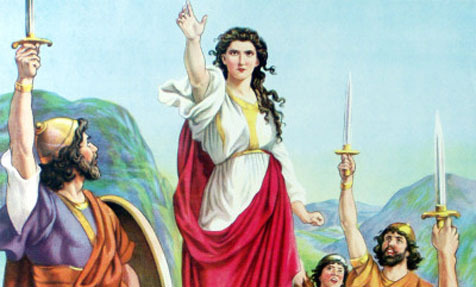 Like Deborah, I arise to pray for revival in this land and fearlessly confront the wickedness in high places! Like Deborah I redeem the time and take advantage of destiny moments! Like Deborah, I have no fear, confusion, lust, doubt, guilt or regret! Like Deborah, I make the best of all opportunities presented to me by God! I believe in the gifts of the Holy Spirit and in the prophetic anointing in particular! I speak the mind of God! I do not add, subtract or dilute the Word of God! I preach the Gospel of Christ Crucified! I do not please men, but God who sees my heart! I am not an entertainer, but a servant of God! Like Barak, I have faith in God! Like Barak, my name is written in the Book of Life! Like Barak, I humble myself and I honor all true servants of God, all true prophets that God sends in my way! Like Barak, I am free from selfish ambition and all I desire is that God should take the glory for my successes! Like Barak, I submit to others in the body of Christ out of reverence for God! Like Barak, I love team work with other brethren in the Church! Like Barak, I do not act with presumption! I wait for God’s Spirit to speak and move! I follow in obedience and trust! The victory is sure and it is mine! Peace be upon Warri for the next forty years; from now until 2053! All the glory to the Lamb who sits upon the throne!